The Federal Highway Administration conducts highway cost allocation studies to evaluate highway-related costs attributable to different vehicle classes and the extent to which user fees paid by different vehicles cover their highway cost responsibility. This comparison of user fee payments and cost responsibility indicates the relative equity of Federal highway user fees. The closer the match between user fees and highway cost responsibility for each vehicle class, the more equitable is the user fee structure. If certain vehicle classes pay less than their share of cost responsibility, other vehicles will pay more than their share of costs. In effect those paying more than their share of costs subsidize the operations of the vehicles that pay less than their cost responsibility. Because truck size and weight policy changes can affect the relative infrastructure costs attributable to different vehicle classes, highway cost allocation is an important consideration in truck size and weight policy analysis. 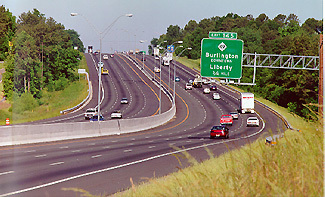 The last major Federal highway cost allocation study was completed in 1997. An Addendum to that study was released in 2000 that updated and extended analyses in the 1997 study. Following completion of the 1997 study, FHWA worked closely with States to develop software that States could use in conducting their own highway cost allocation studies. That software was completed in 2002.